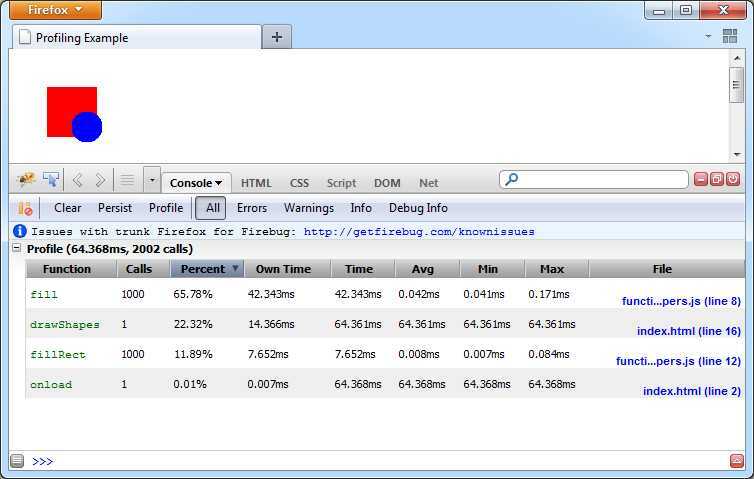 To get started, simply go to the Firebug Web site, install the plugin, load a page in Firefox and activate Firebug. Click the Profile button under the Console tab once to start profiling, and again to stop it. Firebug will display a list of functions, the number of times they were called, and the time spent in each one. Your browser does not support the HTML5 Canvas. // Draw a red rectangle many times. // Draw a blue circle many times. Note: This is a contrived example written to illustrate a point. It would be just effective, and probably a better design overall, to extract two methods named drawRectangle() and drawCircle(). See Extract Method. What we’re doing here is saving the original function by assigning it to another function with the same name, prefixed with an underscore. Then we’re writing over the original with our own function that does nothing but wrap the old one. This is enough to make it appear in the Firebug profiling results. The beauty of this approach is that it only runs when the Firebug console is turned on. When it’s not, the conditional check fails and the code block is not executed. The check also fails in other browsers such as IE9 and Chrome 11 beta, which is exactly what we want. One disadvantage is that you have to write a separate function for each native function you want to override. In the above example, a significant amount of time is probably spent in context.arc(), but we didn’t override it so there’s no way to tell. It may be possible to override and wrap every function in a specified object automatically, but I haven’t tried that yet. For now, I’ll leave it as an exercise for the reader.